PARIS, France, January 19, 2012 (ENS) – The Senate of France has passed legislation that transfers two Pacific atolls used for atmospheric and underground nuclear testing back into the public domain of French Polynesia. The atolls of Mururoa and Fangataufa in the Tuamotu Archipelago of French Polynesia were ceded to France in 1964 to allow the French military to conduct the tests. More than 200 nuclear tests were conducted at the two atolls over a 30 year period ending in 1996, 40 of them atmospheric. 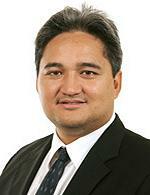 Senator Richard Tuheiava, who represents French Polynesia, introduced the bill on January 11. It was passed and will now move to the French National Assembly. The measure provides that the atolls, located in the middle of the South Pacific about halfway between Australia and South America, will again be under the domain of French Polynesia from January 1, 2014. The bill makes it a crime to undertake research for military purposes on the atolls, punishable by 15 years’ in prison and a fine up to 300,000 euros. At least once a year, France’s Institute of Radiation Protection and Nuclear Safety would conduct a fact-finding mission to analyze and measure radiation on the two atolls, and make the results of these missions public within a period of 12 months. The bill provides for creation of a national commission under the Prime Minister of France to monitor the environmental consequences of nuclear testing on the atolls. The commission would produce a public report with follow-up every three years. 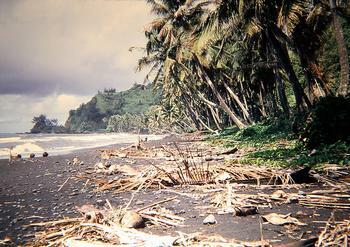 The commission would include the ministers of defense, health and environment of both France and French Polynesia, legislators from both countries, mayors of the local communities, and representatives of militry, civil and scientific associations in the field of environmental protection in French Polynesia. The Minister of Defense would provide the commission with the information necessary to carry out its tasks, except for military secrets protected by law, the bill states. The current French Defense minister, Gerard Longuet, says France has a duty to safeguard the information contained in the atolls, to prevent nuclear proliferation. Moruroa, also spelled Mururoa, was the site of years of protests by Greenpeace and New Zealand peace groups aimed at stopping the nuclear weapons testing. In 1972, Canadian Greenpeacer David McTaggert used his personal sailboat as a protest vessel. After sailing inside the exclusion zone around the atoll, McTaggert’s boat was boarded by French commandos. They damaged the vessel and and beat up McTaggert, who lost the sight of one eye but was able to save film of the incident and release it to the media. The protests succeeded in 1974 when the French government announced the end of its atmospheric nuclear testing program. McTaggert became chairman and chief spokesman of Greenpeace in 1979, retiring in 1991. 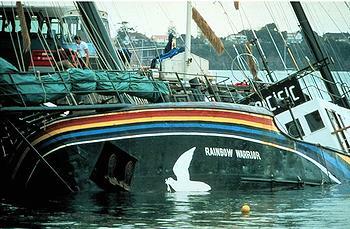 In 1985 the Greenpeace ship Rainbow Warrior was bombed and sunk by France’s external intelligence agency, the DGSE, in Auckland, New Zealand, as it prepared for another protest of nuclear testing in French military zones. One crew member, photographer Fernando Pereira of Portugal, drowned on the sinking ship while attempting to recover his equipment. Two members of the DGSE were captured, sentenced and imprisoned, but eventually repatriated to France. The other bombers were not arrested due to lack of evidence. In 1987, under international pressure, the French government paid $8.16 million compensation to Greenpeace. 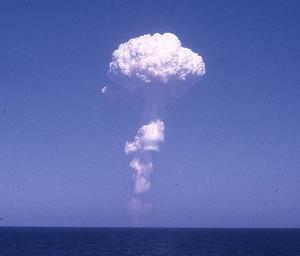 French President Jacques Chirac’s decision to run a series of nuclear tests at Mururoa in 1995, just one year before the Comprehensive Test Ban Treaty was to be signed, caused worldwide protest. But in August 2006, an official report by the French government confirmed the link between an increase in cases of thyroid cancer on the atolls and France’s atmospheric nuclear tests. 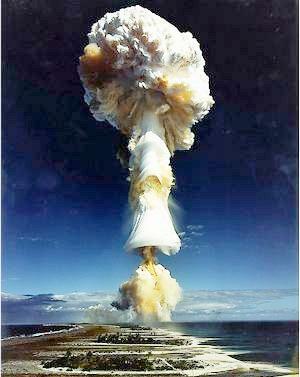 France said on in March 2009 that it will compensate 150,000 victims of nuclear testing in French Polynesia and Algeria. An initial sum of 10 million euros was set aside for military and civilian staff and for local populations who became ill from radiation exposure.